If there were a cricketing equivalent of Roger Federer vs. Rafael Nadal, or say, Real Madrid vs. Barcelona it would probably be the rivalry between Australia and South Africa. The two teams have never ceased to amaze us on the cricket field. There have been a countless number of nail-biting encounters between these two sides which have gone right down to the wire. Australia dominated the rivalry towards the late 1990s and early 2000s but despite that, the matches played out between these two mighty sides have been nothing short of a roller coaster ride. Out of the 86 matches played out between Australia and South Africa, there have been 3 ties, which just goes to show how closely contested their matches have been over the years. Out of the remaining 83, Australia led the head to head by a small margin of 44-39. As the two sides get ready to square off in a 5 match ODI series starting this Friday, we take a walk down memory lane as we reminisce the top 5 ODI matches played out between them. Coming into the second match of the triangular series between Zimbabwe, Australia, and South Africa in Zimbabwe, the Aussies were looking to make it two wins in two after demolishing the hosts in the first match by a whopping 198 runs. They were up against a formidable South African side in the 2nd ODI led by AB De Villiers. Australia got off to a solid start, led by the openers Aaron Finch and the late Philip Hughes. After Hughes’s dismissal, Finch carried the attack forward for the Aussies as he scored a magnificent ton off 116 balls. George Bailey, who was the captain of the team back then, and current captain Steve Smith took the attack to the South African bowlers during the middle overs. A late surge by tailender Mitchell Johnson led to the Proteas reaching a high total of 327 in their allotted 50 overs. With the commencement of the 2nd innings, South Africa got off to a great start thanks to the opening pair of Hashim Amla and Quinton De Kock who put on 44 for the opening wicket. They were not able to capitalise as they both perished soon after the 50 run mark. With AB De Villiers and Faf Du Plessis out at the crease, South Africa turned the match on its head as the duo went on to score brilliant centuries and put up a record-breaking partnership of 206 runs for the 3rd wicket. 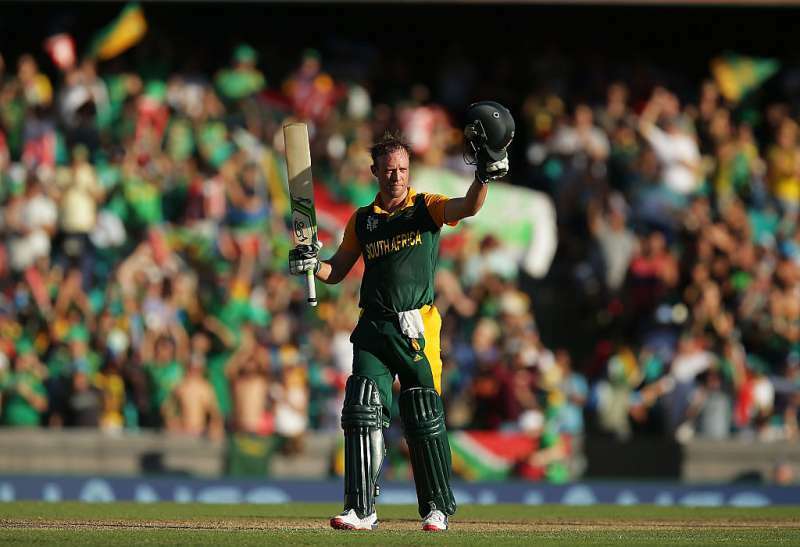 Both De Villiers and Du Plessis played their innings with a combination of calmness and well-timed aggression. Despite cramping up after reaching his 90s, De Villiers did not back down as he continued to take on the Australian bowlers with ease. After Du Plessis’s departure, De Villiers and JP Duminy closed the curtains on the Kangaroos as they comfortably won the match with 3.2 overs remaining and with 7 wickets to spare. The triangular series between Zimbabwe, Australia, and South Africa was one to forget for the Kangaroos. They lost 2 out of their 4 matches including a surprise loss against home side Zimbabwe in the 4th game of the series. They still managed to reach the final but were nowhere near South Africa’s standards as the Proteas won the final by 6 wickets.